THE RELIGIOUS ORDER that ran the Tuam mother and baby home said the home was “under the supervision, direction, and inspection” of the Irish State in a confidential letter to a government minister. 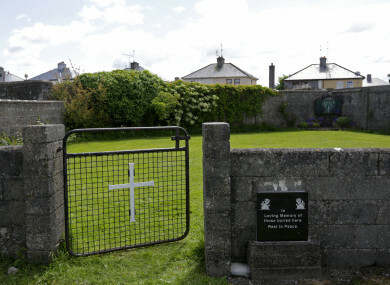 It said that any infant deaths at the home were registered at the time and that both the Department of Health and Galway County Council must have been aware that burial arrangements would have to be made for the children. The letter also said the Sisters of Bon Secours Ireland had not been given “full and open access” to records involving the home. The correspondence gives a clear picture for the first time of the order’s views on the Tuam controversy saying that the home was “created and operated” by the Irish government with the involvement of both the Department of Health and Galway County Council. In the letter, Country Leader Sister Marie Ryan also expressed surprise that Minister Katherine Zappone wanted to meet with them given a commission of investigation was underway. She was responding to correspondence from Zappone who had asked the Sisters of Bon Secours Ireland to share costs with the State arising from the Tuam scandal. That letter, sent on 24 July, has also been obtained by the transparency group Right to Know following an intervention from the Information Commissioner. In the letter from Sister Marie Ryan from 2 August, the order said that the Mother and Baby Home had been “created and operated by the Irish State”. The order said that when the home had been closed in 1961 they had passed on all documentation to the local authority in Galway. They said work undertaken by their own social historian showed that Galway County Council had significant involvement in the House including payment for a doctor and a chaplain. “It also appears that the Home was inspected by the Department of Health inspectors,” she said. The letter also explained that “the deaths of the infants were registered at the time”. The order said that following Tuam’s closure, the property was taken into the possession of the local authority and the land developed for social housing. They said they had looked for Galway County Council records from this time but they had been “denied to” them. Sister Ryan wrote: “We would assume that, for the purpose of taking possession of the former Home and for its development as local authority housing, Galway County Council would have been aware in the late 1960s of the existence of graves at the site. They said if Minister Zappone wanted to “engage in dialogue” with the Sisters of Bon Secours Ireland, then they wanted clarification of whether this was also happening with Galway County Council and the Department of Health. The order also said that when asked for a contribution towards the creation of a memorial garden by a local organisation, they had been happy to do so. In Katherine Zappone’s original approach to the Sisters of Bon Secours Ireland, she said the government was “committed to identifying the most appropriate option for dealing sensitively and respectfully with the human remains found at the site”. Zappone said options being explored included memorialisation with no further excavation, a full excavation, exhumation of all remains and DNA analysis, ad reburial elsewhere. She said that given the order’s involvement in the site from 1925 to 1961, it seemed “reasonable to seek discussions with the Order about sharing a proportion of these costs with the State”. In a second letter to the religious order, the Minister for Children said that the Commission of Investigation and its inquiries were independent of the Department. She said she had no information on the interactions of the Bon Secours and the Commission and that her interest relates “exclusively to the future of the site and the remains interred therein”. Zappone wrote: “As such I see this as separate and without prejudice to the ongoing investigations into the circumstances and responsibility for the disposal of human remains in this way. She said all parties including the State and the order had a “shared moral and ethical responsibility” to “compassionately respond to this tragic situation”. They said: “As indicated in the correspondence, Minister Zappone considers that all parties involved with the former institution have a responsibility to ensure appropriate action is taken to honour the memory and dignity of the children who died. No comment on the contents of the correspondence has been made by the religious order as yet. Email “Religious order that ran Tuam says it was 'under supervision, direction and inspection' of Irish State”. Feedback on “Religious order that ran Tuam says it was 'under supervision, direction and inspection' of Irish State”.